Has the highest strength and precision in the KHK standard rack series. 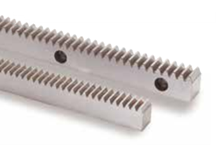 Bolt holes can be remachined as carburizing is applied only within the tooth area. J Series products are also available.